I don't scrapbook generally but if I did, I'd do it Jim Morrison style. Today I discovered a new Jim Morrison book. It's by Ohio's own James Henke, the curator of the Rock and Roll Hall of Fame Museum in Cleveland. By the way, the museum is a grippingly relevant landmark, but that's another blog. 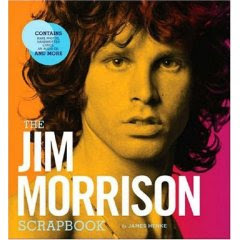 The Jim Morrison Scrapbook includes new interviews with some of Morrison's friends, family members, and music industry folk. It also features 24 pieces of removable facsimile memorabilia, such as Jim's handwritten lyrics to "L. A. Woman." the doors.... new british invasion not enough these days? this just came to me, but have you noticed how almost everybody wears green in The Great Expctations? you told me once of the guy back in grad school who would entitle all his philosophy papers by Doors songs.... that was something.